Marc Jacobs Daisy Eau So Fresh exudes so much optimism, joy & happiness! 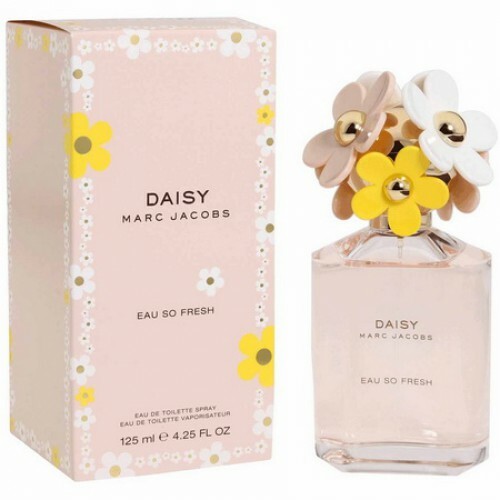 Marc Jacobs Daisy Eau So Fresh 125ml. Eau De Toilette - White, pink and yellow daisies , like butterflies , fluttering above a green meadow , decided to freeze time , spreading their thin wings . Looking at them from a distance, you never know who it is - flowers or butterflies . This air is illusory, together with easy , which inspires the spirit of summer , Marc Jacobs embodied in the new version of his famous " daisy » Daisy - the sunny and charming fragrance that exudes so much optimism , joy and happiness ! Song: grapefruit, green notes , raspberry , pear , jasmine, rose, violet , litchi , apple blossom , musk, Virginia cedar, plum. "Camomile" series of perfume from the famous Marc Jacobs began in 2007, shortly after the release of flavor Daisy. This series includes elegant Daisy Black Edition, graceful Daisy Bloom, cheerful Daisy Garland, and wood-bold Daisy Pop Art Edition. Already at the beginning of 2011 all the representatives perfectly floor there was a remarkable opportunity to purchase perfume Daisy Eau So Fresh. Already it is clear from the title it is a fresh, lighter version of the original scent, which ever is suitable for young girls. Oddly enough, but the aroma of chamomile is not ranked in the composition of toilet water. Just the melody Eau So Fresh is incredibly gentle and natural, so Marc Jacobs daisy chose to display all of these qualities. Discloses a fragrance with citrus notes from red ripe grapefruit, which interestingly accompanied with sweet Malinke. Complement this symphony fruit lychee and pear with green leaves. Component in this floral fragrance is a mix of wild roses, violets, jasmine and apple color. Basis of the composition are plum, cedar and musk. Not hurt just to remind about the creator of this unforgettable flavor, namely Alberto Morillase. That this was a perfumer creator of the first flavor of this line.